Heard about the phenomenon called indoor grilling? From open or covered electric grills to contact grills, grill pans, and cooktop inserts, there are all kinds of indoor grilling options that are inexpensive to purchase, take little time to clean up, and store conveniently out of sight. Best of all, whether it’s a bright, sunny day, a rainy afternoon, or a cold, wintry night, you can still enjoy mouthwatering, healthy meals any time you’re in the mood to grill! Featuring expert advice on reducing fat and calories in grilled foods, using grilled foods in sandwiches and wraps, and serving up a party with a meal that your guests will remember, Indoor Grilling For Dummies has all the buying and cooking tips you need to become an indoor griller extraordinaire! Lucy Wing, former food editor at McCall's and Country Living magazine, has been writing about grilling for ten years. Tere Drenth, a freelance writer and award-winning editor, grills nearly every day. PART I: Mastering Indoor Grilling. Chapter 1: Why Grill Indoors? 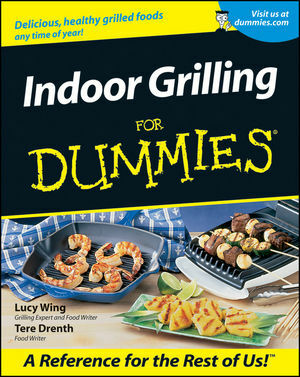 Chapter 2: Choosing Indoor Grilling Equipment and Accessories. Chapter 3: Understanding the Basic Techniques of Grilling Indoors. PART II: Accounting for Taste. Chapter 4: Making Marinades and Rubs. Chapter 5: Serving Up Sauces. Chapter 6: Quick and Easy Favorites. Chapter 7: Beefing Up Your Repertoire. Chapter 9: Getting a Bird's-Eye View of Poultry. Chapter 10: Plenty of Fish in the Sea. Chapter 12: Great Wraps and Salads. PART IV: Dressing Up for Dinner. Chapter 13: Warming Up the Crowd with Appetizers. Chapter 14: Making the Occasion Special. Chapter 15: Getting Your Just Desserts. Chapter 16: Ten Great Reasons to Grill Indoors. Chapter 17: Ten Ways to Make Grilling Healthy and Safe. Chapter 18: Ten Ways to Stay Lean and Healthy. Chapter 19: Ten Ways to Make Your Grilled Meals Memorable.